Ballyfitz demonstrated he has abundant reserves of stamina when landing the Pertemps Final by three lengths from 7/1 favourite Miko de Beauchene. The 18/1 shot battled on well from the top of the hill and was clearly suited by the three-mile trip. Winning trainer Nigel Twiston-Davies commented: “That was a great performance from Ballyfitz. “He won superbly at Haydock the last time and we thought he’d do the same thing here. We are very, very pleased. He’s been very good this season. 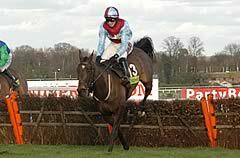 He’s back over the hurdles, he had one run over fences, and he’s done great. “I thought he was handicapped up to the hilt and you are always worried in this race that there could be something at the bottom who has been really primed for the day. “He likes testing ground and so today’s conditions were ideal for him. It was a brilliant ride from Paddy, as we’ve come to expect. “It has been a great season for us. Knowhere runs in the Gold Cup tomorrow and is very well. If there are any chinks in the armour of the favourites, he could exploit them. Winning rider Paddy Brennan added: “This was a great way to finish the day. “I was very happy with the way he was travelling at the top of the hill and I thought he might have a bit more speed in the finish than Miko de Beachene. “This victory was a great way to cement my relationship with Nigel and I am happy for him as he hasn’t had a winner at The Festival for a few years. It’s just lovely for all the team. “Ballyfitz stays well and loved the softened ground which is taking a bit of getting which really suited the horse well. I know how hard it is at Cheltenham to get a winner so any winner is special and I’m delighted to be amongst them. Miko De Beauchene, who won the Welsh National at Christmas and the Red Square Vodka Gold Cup at Haydock last month, tried his hand at hurdling today, and finished second in the Pertemps Final. Malcolm Jefferson, trainer of third-placed According To Pete, said: “He keeps running well and the handicapper never lets him go - he’s not won this season, because he goes up two or three pounds every time he runs. He’s an honest little horse and I wish they were all like that.